We’ve seen a lot of anti-smoking ads come and go over the years. The Centers for Disease Control (CDC) has just launched a new series of ads to help smokers quit. Many of the women I talk with consider themselves to be just “social smokers,” and not “real” smokers. They just like to smoke a little when they drink. There’s no harm in that, right? Well, actually there is a lot of harm being done, even if you smoke as little as one cigarette a day. 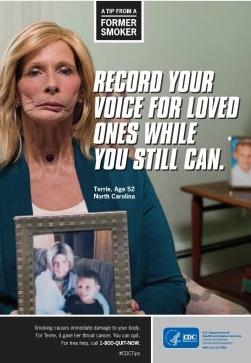 I commend the CDC and other anti-smoking organizations for creating impactful ads that show the dangers of smoking, such as this interview with Terri Hall, who speaks in a deep, throaty rasp after cancer ravaged her voice box, teeth and upper palette. Terri’s casual habit eventually turned into an insidious, two-pack-a-day, full-blown addiction. No surprise here, since nicotine is highly addictive (some say it’s as addictive as heroin). At age 40, she was diagnosed with throat cancer, and doctors removed her larynx. She now speaks through a device through a hole in her neck. She says she doesn’t even remember what her own voice sounds like, and regrets that her grandson will never hear her real voice. These in-your-face ads are "literally lifesavers," says Tom Frieden, CDC director. In fact, Hall attracted so much attention (last year’s ad on YouTube now has over 1.4 million views) that she appears in the CDC’s second ad campaign, which launched late last month. Last year’s ad campaign, featuring real people with real stories, doubled calls to their quit line: 800-QUIT-NOW. But the impact of the ads may be short-lived. Last year, after the ads ended, so did the calls to the quit line. And that’s why we need to create more than simple awareness. We need solutions. Long-term solutions that help people realize there’s an alternative. It’s called vaping an e-cigarette. Unfortunately, even the very best e-cigarettes on the market can’t be promoted as a smoking cessation device. It’s too bad. Because many women (and men) have used the e-cigarette as a crutch – a bridge – to a smoke-free life. Even if they don’t quit smoking, they’re trading the 4,000 chemicals and 57 known carcinogens in cigarettes for just four main ingredients in e-cigarettes (the main base, PG, is the same stuff in asthma inhalers). Terri and other women who smoke know that it’s very difficult to quit. Terri said she even smoked during radiation treatments for oral cancer. It was only after surgery to remove her voice box that she finally quit smoking. “I went into my bedroom, picked up a cigarette and lit it, then I looked at myself in the mirror. I saw what I was doing and realized what a fool I was,” she said. But what if she had switched to the e-cigarette, long ago, before her smoking habit had ravaged her voice box? It’s too early to tell what the long-term effect will be when more and more people switch to e-cigarettes. We can only hope that it will prevent other people from going through what Terri and other smokers go through in their struggle to quit. We do know one thing: while ads like the CDC’s impactful ads may create awareness, the e-cigarette offers an alternative -- a real solution. Passive Smoking or Second-Hand Smoking is also a cause of lung cancer in women because their husbands smoke and I do agree with you that many women have a chances of lung cancer due to second-hand smoking.